English is a Germanic language and the primary language spoken in the United Kingdom, Ireland, United States, Canada, Australia, and New Zealand. English is the main language of the world, spoken at least as a second language in virtually all developed nations. It gained this position by becoming the language of commerce in the 18th and 19th Centuries following the spread of the British Empire, the Industrial Revolution and the influence of the United States. English is part of the Teutonic (Germanic) branch of the Indo-European (Japhetic) language family, but incorporates certain external influences from Greek, French and Old Norse. The name English derives from the medieval tribe the Angles, who resided in modern-day South Denmark around 400AD. They migrated to Britain around 449AD in great numbers, along with their immediate Southern neighbors the Saxons from modern-day Lower Saxony and Schleswig Holstein, and northern neighbors the Jutes from Jutland. They quickly took possession of the main part of the island of Britain, giving that section its name, England, and their language became the language now known as English. English has undergone substantial changes in the subsequent 1500 years, and is generally divided into three categories or eras. First page of the Beowulf manuscript. 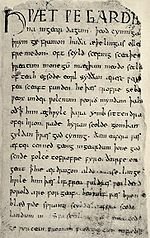 Old English is the original language spoken by the Anglo-Saxons, as for example in the 7th Century epic poem Beowulf. the sun clad in radiance, shines from the south." By the Middle Ages, English had undergone some changes due to invasions by the Old French-speaking Normans and the Old Norse-speaking Vikings. A good example of Middle English is Geoffrey Chaucer's 'The Canterbury Tales' of the late 1300s. And if that he encressed were or noon. And if he had profited or not." Modern English begins with the works of William Shakespeare. These works extensively codified and expanded the English language, adding thousands of new words, especially technical words derived from ancient Greek and Latin, for example 'metamorphize' and 'negotiate'. Although there have been some changes since then, notably the extinction in general use of the informal versions of 'you', 'your' and 'yours' ('thou', 'thy' and 'thine'), the English language remains largely the same. ↑ Beowolf: diacritically-marked text and facing translation Dr Benjamin Slade. ↑ The Shipman's Tale: An Interlinear Translation Part I, lines 1-157 Larry D. Benson., Gen. ed., The Riverside Chaucer, 1986, ISBN-10: 0395290317 Houghton-Mifflin Company. Web. Harvard College. This page was last modified on 6 December 2015, at 00:36.